We are pleased to announce that we are hiring for 2019/20 Raven’s Roost Team Member positions. To apply, please visit eRezlife: Job Postings. You will be required to complete application questions and provide a resume and cover letter for this job position. Please note that this job posting opens on Monday February 25th and closes on Monday March 11th, 2019th, 12:00 pm. Interviews will be held the week of March 25th, 2019. What is the Raven’s Roost? 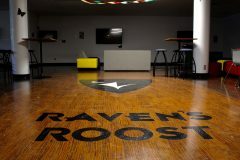 The Raven’s Roost is a student lounge and recreation area located in the tunnel level between Stormont and Dundas House. 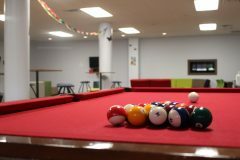 This is where a wide variety of residence programming happens including open-mic nights, talent shows, movie marathons, and much more! The Raven’s Roost is open Sunday – Thursday from 6pm to 12am and Friday and Saturday from 6pm to 1am.